We create illustrations for all your digital needs. 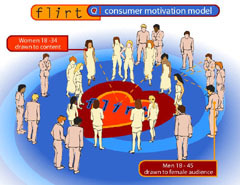 Flirt.com needed illustrations to illuminate key concepts and provide graphic embellishments for its business plan. We created illustrations that where consistent with Flirt's branding. "Attract Women, Men will Follow"